Mapping quality = 60 for all aligned reads. I tried to calculate Wilcoxon-rank sum test for 2 groups of base quality and got a p-value of 0.0301490435667 (assume that alpha is 0.05). Is that the reason why GATK call that ALT base? If so, how GATK get a quite high quality like that (25.78, i.e, accuracy is more than 99%) while there are only 2 ALT aligned bases among 8 aligned bases? How GATK calculate variant quality in this case? @namsyvo The calling algorithm is more complex; see the HaplotypeCaller docs for details. 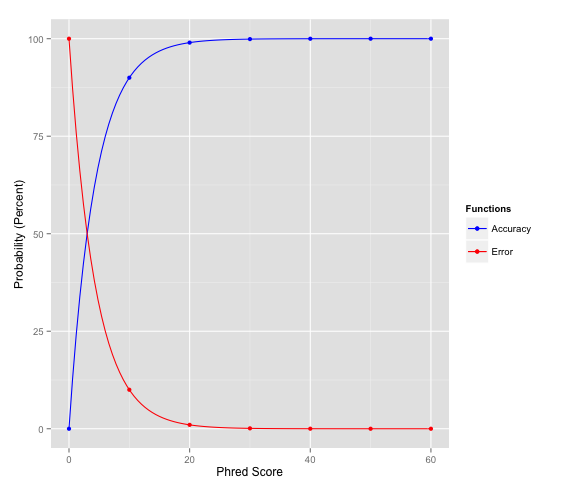 Why in a previous post about SNP hard filtering you mention marking as 'FAIL' SNPs with a strand bias phred-scaled p-value > 60 (thus, marking as 'PASS' SNPs with a strand bias score < 60)? Should it not be the opposite if the confidence decrease with the phred score? I hope this document and this document will answer your question.